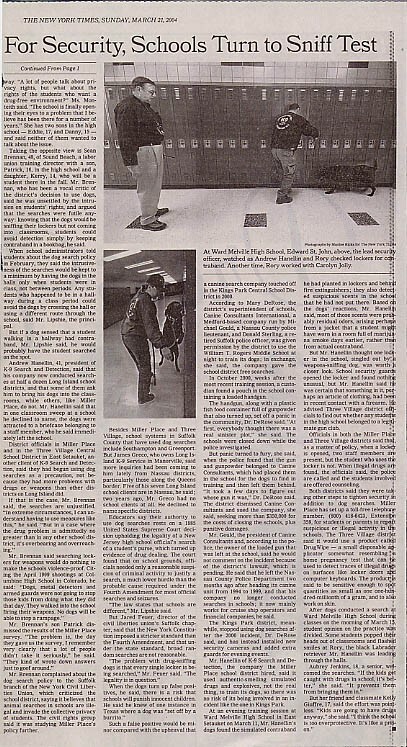 Click any of the images to link to the full article. 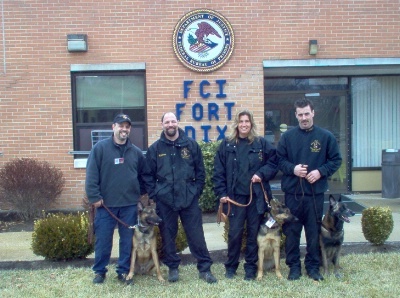 K-9 Search & Detection was selected to provide K-9 Narcotics Detection services to an area Federal Correctional Facility. 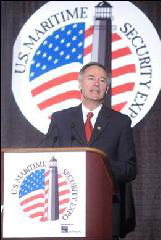 As the Official Explosive Detection K-9 provider for the Maritime Security Expo, K-9 Search & Detection, Inc. conducted sweeps of the Jacob Javitz Convention Center in New York City prior to the arrival of Department of Homeland Security Under-Secretary Asa Hutchinson and Admiral James Loy, as well as for Mr. David Collenette, Canadian Minister of Transportation. 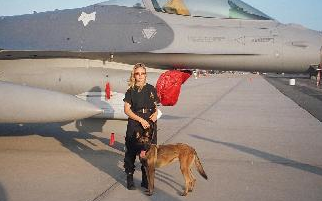 K-9 Search & Detection was contracted to support the New York Air Show in Calverton, New York with Explosive Detection K-9 Services. K-9’s were used to check cars and trucks entering the interior of the jetpark, as well as to check aircraft open for display to the public on the tarmac. The weekend-long event went without incident and a great time was had by all! The event included an arial and ground display of Military Aircraft, Sky Divers, Arial Stunt Pilots, a “Nitro Powered Funny Truck”, a full size Carnival and Fireworks by Grucci! The event was enjoyed by well over 60,000 people! Thanks to all who stoped by our booth to say hi to the K-9’s and their handlers! 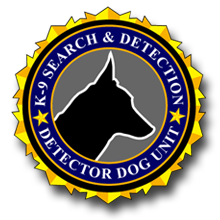 K-9 Search & Detection was contracted by Security at the 30th Annual Daytime Emmy Awards held on May 16 2003 at New York City’s Sheraton Center and at Radio City Music Hall. Explosive Detection Dogs were used to clear the Banquet Hall and route between both venues. MTV Star Sharon Osbourne stops to thank K-9 Cole for keeping the 30th Annual Daytime Emmy Awards safe!